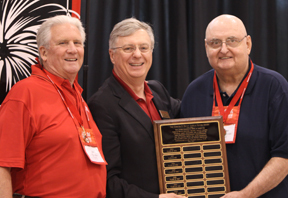 The 2011 Big Bash Reunion Weekend at Wabash College came to a celebratory close on Sunday when President Pat White and Alumni Director Tom Runge ’71 presented awards to the classes and class agents who made the weekend so successful. See photos from the Awards Brunch here. More than 500 people from 35 states and three foreign countries returned the College, including 349 alumni, to take part in activities that ranged from colloquies to Chapel Sing and from the Wally Wabash Golf Outing to the Class of 1961’s memorial service honoring their classmates who had passed. Attendance was up by 70 over last year. The oldest alumnus to sing the official Alumni Register was Emory Simmons ’41, who was back to celebrate his 70th class reunion. The youngest to sign the Register graduated three weeks ago. One of the highlights of every Big Bash Reunion Weekend is the Alumni Chapel Sing competition. Each reunion class took a turn standing on the steps of the Pioneer Chapel to belt out Old Wabash — recalling a rite of passage every Wabash freshman knows well. After every class had “competed,” current students, honorary alumni, and alumni ages 23 to nearly 90 sang the cherished fight song together. 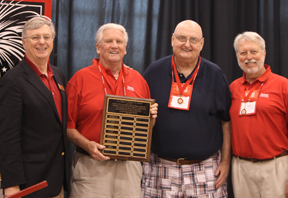 Winning the Robinson-Regan Award for the Alumni Chapel Sing competition — an award named in honor of the creators of Old Wabash that’s based on a combination of creativity, knowledge of the song, and intangibles — was the Class of 1966. The Class of 1966 pulled out all the stops, starting their performance with music from 2001: The Space Odyssey with a fog machine pumping “smoke” from within the Chapel. As the class filed out the doors, Chain of Fools rang out on a nearby boom box and each class member donned a bald “skull cap” with a bright red “W” painted on the top. After dancing their way into the judges’ hearts, the Class of 1966 sang both verses of Old Wabash with tremendous enthusiasm to take first place. Accepting the award was Jay Fisher, who came up with the wild ideas, and Bill Berry, who led the group in both song and dance (pictured above with President White). The most prestigious and most deserved honor of the weekend is the Dorman Hughes Award, which is presented each year to the men who performed most admirably in communicating College news and generating enthusiasm for Big Bash Weekend. 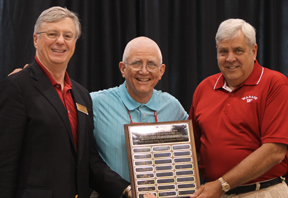 The award, voted on by the staff of the Alumni and Parent Relations Office, was presented to a trio from the Class of 1961 — Sam Hildebrand, Denny Sheridan, and J.B. Bachman (pictured with President White at left). Two awards are given for reunion weekend participation. One, the 1909 Trophy Cup, goes to the reunion class with the highest percentage of alumni returning to campus for Big Bash. The second, the 1928 Attendance Trophy, is given to the class with the highest number of alumni coming back to campus. The Class of 1961 earned both honors at the 2011 Big Bash with 58 men signing the Alumni Register, which represents 37 percent of the class. Finally, 1961 was honored with the Edmund O. Hovey Annual Giving Award. The Hovey Award is given annually to the class that boasts the highest percentage of alumni giving to the Annual Fund. The Class of 1961 set what appears to be an all-time record with more than 70 percent of the class making a gift to Wabash. Sheridan and Bachman accepted the award on behalf of their class (at right with President White). Runge also thanked scores of behind-the-scenes workers who made the Big Bash Weekend run so smoothly — from Bon Appetit food service serving over 500 meals in 11 locations Saturday night to Campus Services moving tables and chairs at all hours of day and night. Just as he welcomed the alumni back to campus on Friday evening, President White bid them farewell at the conclusion of the Awards Brunch. Referencing a scene from the movie Hook, in which a grown-up Peter Pan returns to Neverland and is not recognized by the Lost Boys, President White said that while the men of Wabash have changed over time they are still, inside, Wabash men. He said Wabash itself has changed over the years, but remains as it was as in their memories. “You have come to say, ‘There you are, Wabash. You’re still there, still the place we love, still the place that did so much for us and for our dreams,'” President White said.